Aww. When Adrian Sutil gets in a decent or mid-pack car, he's capable of some hilarious upsets. Now both he and Esteban Gutiérrez are looking for Formula One rides next year, as Sauber will be replacing them with Felipe Nasr and Marcus Ericsson, respectively. Last week, Sauber announced that they were replacing Gutiérrez with Ericsson, proving that we probably get Sauber for at least one more year. That one seems like a step down, to be honest. Gutiérrez is the youngest champion in history for Formula BMW Europe and won the inaugural GP3 season. He became a reserve driver for Sauber after winning Formula BMW, and to he honest, he probably deserved better than a backmarker car to really shine. Let's hope he pops up elsewhere. Ericsson is another Formula BMW champion, but instead in the smaller British Formula BMW series. He also won Japanese Formula Three, but finished much lower in his GP2 years than Gutiérrez. Of the two Caterham drivers up for grabs now that the team has entered administration, I would have picked Kobayashi instead, but oh well. Sutil's replacement is an even bigger mystery unless Sauber is going to a straight-up we-need-the-cash pay-driver-palooza. Losing Sutil means that Sauber has two relative rookies now at their team, plus it's hard not to be a fan of Sutil. In the right car, he'll can spoil the day for some of the larger, more established teams. Sauber's car this year was a dog, though, getting beaten in the constructor's points by financially-troubled upstart Marussia. Let's also not forget that Sutil is an interesting character, having gotten in a bar fight in Shanghai and continually providing plenty of gossip rag fodder by throwing shade at sometimes-friend-sometimes-foe Lewis Hamilton. Come to think of it, maybe he's got a future in NASCAR, but he's far too good at driving a formula car to wander off over there just yet. Don't get me wrong, Felipe Nasr is a promising young driver, having won Formula BMW Europe and British Formula Three in the past. He was a test driver for Williams in 2014. However, I feel like teams develop the best when there's at least one more experienced driver on the team, and Sauber's lost that in letting Sutil go. We have been following Felipe's career path for some time now, and he fully deserves his position in Formula One having had a very successful career in junior categories. We are happy that he will be driving for our team next year. This means that Brazil will have one more young and talented driver in the sport. Banco do Brasil has been an important partner for Felipe so far, and we are delighted that such a renowned company is contuing to support him during this important step. We look forward to this partnership. Boldface mine. I think we know what's up. Apparently nobody's told Sutil that he's out of a seat, either. His comments to the media are all about how he needs to clarify with Sauber exactly what's happening. 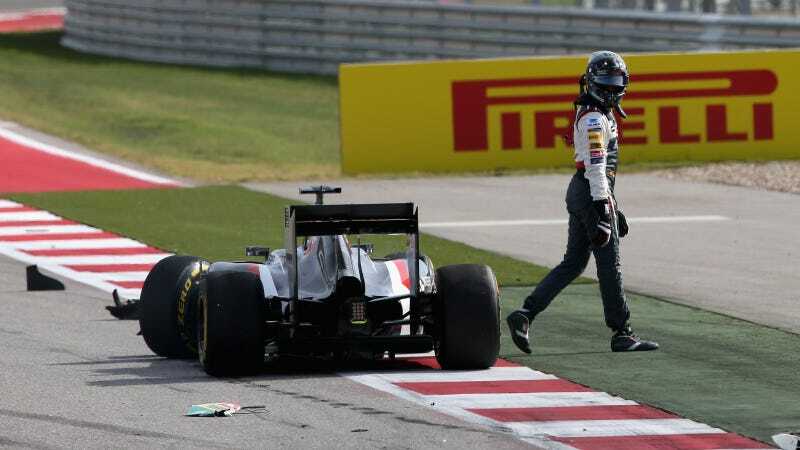 "There are certain things to talk about, definitely yes," Sutil said in remarks published by ESPN. "We have confirmed two drivers but it doesn't mean the drivers are going to drive and it doesn't mean the team is going to drive. So there is no real change from last weekend to this weekend. It's just an announcement and now, of course, in my situation I need to do some talking to sort out the things." Unfortunately, the team is pretty clear in their remarks to the media as to who they say will be driving next year, so I think Sutil's out of luck. Shouldn't he be the first one to know, guys? Really?There's always the three-car team rumors to fall back on, but I highly doubt a team in Sauber's financial situation would be gung-ho to support another car next year.